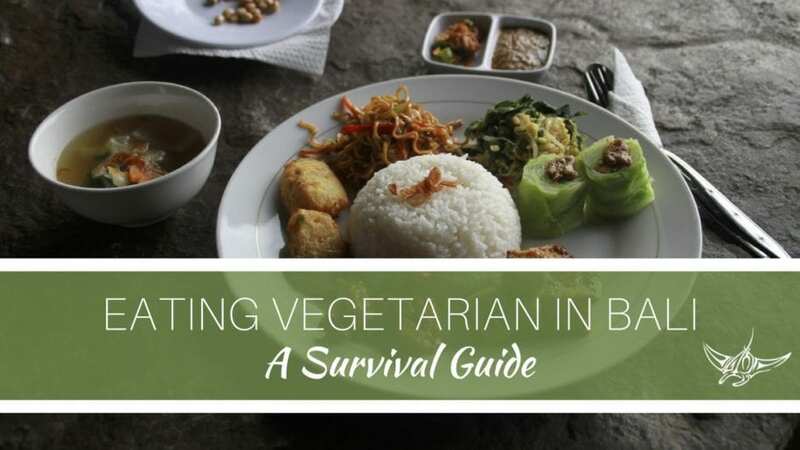 Travelling as a vegetarian can sound daunting to some, but with a bit of research, it is completely manageable. Whenever you read travel guides about local dishes to try in foreign countries, it seems they are always some type of local meat, cooked and spiced to perfection. In many developing countries, locals do not have the opportunity or ability to eat meat-free meals, so even communicating about the fact that you can’t eat meat can be a struggle. Nasi Campur – the nice thing about nasi campur is that you can choose what you want from the selection – be sure to confirm that what is being showcased is in fact what you think it is! Locals love to add some heat for flavour, and unfortunately this can take a toll on a body that is not used to regular doses of hot chillies. Keep an eye out for small bright red vegetables in the food on display and the white circular seeds. If you like heat, all the better! For anyone hoping to avoid the spice, be sure to ask for it without spice “tidak pedas”. If you’re looking to skip the warungs for a day, or to just enjoy some more familiar fare, there are a lot of great options in the more tourist developed areas of Bali. Some areas are well known for their food scenes, like Canggu, Kuta, Ubud and Uluwatu. These locations have a ton of Instaworthy, organic, locally-sourced food on option, and many that specialize in vegetarian fare. If you are in one of these areas, have a quick scan on TripAdvisor and filter by ‘vegetarian friendly’ to find those gems. For any locations outside of these main tourist hubs, it is going to be local food only. Often you’ll find local stalls that serve up nasi campur or pop-up markets that have paper cones filled with light rice meals for takeaway. For those making the trip out to the Nusa islands, there are quite a few options to choose from, as long as you are staying near the busier hubs. On Nusa Lembongan, these tourist centered areas include Mushroom Bay and Jungut Batu which offer a wide variety of restaurants catering to many different tastes and preferences. Many of the accommodations also feature a little restaurant or are situated beside a restaurant which adds to the convenience factor. It is important to note that any restaurants that serve mainly local dishes will have very limited western options. It seems that almost all of them offer some combination of simple pizza, spaghetti with olive oil and paprika, a veggie burger or sandwich (not overly common), and a curry of some kind. There are definitely some smaller businesses that are also realizing the potential of the smoothie bowl. If you haven’t tried one, please do yourself a favor and order it. They are comprised of a smoothie like base (usually a blended combination of frozen banana, a local fruit and some sort of coconut or dairy milk), topped with fresh tropical fruits and often some sort of seeds, nuts or granola. They are always made fresh, incredibly refreshing on hot days, and make are a much healthier choice than most of the alternatives. Since our resort is removed from the busier areas of the island, we offer an ample selection of food and beverage options for our guests at the Mangrove Restaurant. For more inspiration from our kitchen, check out our Instagram account @ceninganresort for all the delicious food and drinks on offer! Veggie Burger – homemade hearty veggie patty with caramelized onions on top, likely the most filling meal on the menu! In addition to these options, there are many more appetizers and desserts that are also fit for vegetarians on the menu. Our full menu is available online so feel free to check it out before your visit. If you are interested in making Ceningan Resort your home base during your travels in Bali, let us know and we would be happy to put together a meal plan that works best for you! Now that you are familiar with the vegetarian options, let’s explore the traditional meals that do include meat. It’s good to familiarize yourself with the main meals and what they are called so you at least know what to avoid during your stay. Be aware that the next section includes photos of meat and animals for consumption and may not be suitable for everyone. In Bali, the main religion practiced is Hinduism, so the locals do not consume any beef products. The most common meats used in local cooking are pork, chicken and a wide variety of seafood, especially fresh fish. If you are worried about being able to communicate your dietary needs during your travels, it may be worthwhile to carry a card with you that has information in Bahasa Indonesia about what you are not able to eat. Nasi goreng means ‘fried rice’ and consists of white rice cooked together with beans, carrots, shallots and some form of protein, whether it be chicken, fish or eggs. This is often fried with a spicy sauce or a sweet kecap manis sauce. Basically the same as nasi goreng, but with noodles instead of rice. Pieces of meat (most commonly chicken or pork) that are marinated in coconut coconut milk and a spice blend before being skewered and grilled. Nasi campur means ‘mixed rice’. Generally a stall will have dishes of a variety of meats, veggies, rice, eggs, tofu or tempeh and sometimes noodles. This is often ordered to go (di bungkus) and includes some spicy sauce (samba). A whole chicken or duck is stuffed with local spices before being wrapped in banana leaves and banana plant trunk to bake slowly for several hours. A suckling pig roasted on a spit and stuffed with local spices and veggies while being rotisseried over a coal fire. These dishes use the method of banana leaf wrapped around fish, chicken or tofu by wrapping and stitching it closed with bamboo slivers. This can then be grilled, steamed or boiled until cooked. More of a cooked salad, this dish is naturally vegetarian and a light meal. It features mixed vegetables – generally carrot, potato, spinach and cabbage. It is served with tempeh and boiled egg and topped with a savoury (sometimes spicy) peanut sauce. It is generally not served with rice, but does often come with prawn crackers. This is a soup made with either chicken or fish, featuring a flavourful blend of ginger, turmeric, coconut milk and lemongrass. The soup is a filling meal, as it often has rice noodles included in the broth as well. A Chinese / Indonesian fusion dish of mixed stir fried vegetables like cabbage, carrots, onions, etc. Usually vegetarian but can sometimes be found served with meat. An Indonesian staple, these are local meatballs. They are most often made from ground beef outside of Bali, but locally are usually pork. They can be sold on their own, or in a meatball soup (bakso kuah). By knowing what the common meals and ingredients are in Bali, it will be easier to get an idea of foods to avoid. Although restaurants may insist that the food is meat-free, sometimes communication isn’t always clear, so when in doubt, it’s best to find an alternative restaurant. We hope you have a memorable and enjoyable visit to Bali. The food is certainly one important aspect for fully experiencing the rich culture of this beautiful island.